As the song goes, it's the most wonderful time of the year. I cannot speak for you all but I know there is nothing that I appreciate more than delectably decadent Christmas gifts of the cosmetical variety. We can spend the year looking for drugstore bargains but who doesn't want to be blown away with luxurious beauty booty in the festive season? Lancôme have been one of my favourite high end brands this year and I'll be starting 2014 with a Lancôme wishlist that will include, amongst other Lancôme lovelies, DreamTone, Teint Idole Foundation and the gorgeous Blush Subtil 02 Palette. Top L-R: L'Absolu Rouge Swarovski (I know!) €30, Hypnôse Ultra Dazzling Colours- a gorgeous mousse shadow and comes in a variety of shades €27, Hypnôse Velours Multi-Wear Eyeliner Patches (as somebody who hardly ever gets their winged eyeliner right, this looks like a godsend!) €35 and my absolute favourite of the bunch and must have this Christmas- the Lancôme Highlighter Rose Etincelle- €45. When I swatched this, I actually let out a gasp. It's the most gorgeous gentle ambient glow- it looked quite lilac in the pan but it wasn't lilac when applied and the powder was so finely milled that there was no trace of chunky glitter or excessive sheen. This HAS to be mine this Christmas! When you spend €35 or more on Lancôme products in any given transaction, you have the option to purchase this amazing set for a mere €55. It includes an exclusive Christmas palette and a full size Blush Subtil 02 and has a retail value of over €200. I mean who wouldn't love this as a Christmas gift? As well as Advent Calendars, I have noticed that alot of beauty brands have been bringing out little Christmas treats that you can hang on your tree in the weeks coming up to Christmas and open them up whenever your heart so desires. Lancôme have also come up with a beautiful set of four hanging decorations which contain a mini Rouge In Love lipstick, a mini black Hypnôse Mascara, a lickle Gloss In Love and a beautiful and seasonally appropriate mini nail polish. This set would be a beautiful gift for Christmas or perfect for self gifting and will set you back €46. It's exclusive to Brown Thomas I believe so don't waste your precious time looking in all the wrong places. Lancôme very generously gifted me one of the little hanging decorations and I opened it just for y'all- it contained the mini Rouge in Love lipstick and it is a gorgeous creamy true red which would look good on anyone I'm sure. Lancôme also have a variety of Christmas sets out- Juicy Tubes, Mini Gloss in Love, Advanced Genefique, Visionnaire, Hypnose Mascara sets, loads of fragrance sets- but one set I definitely have my eye on this year is the Dream Tone set because I have been dying to try this since being wowed with the scientific statistics and made aware of the years of research and development to get this product to market the launch of DreamTone over the summer. Will any of you ladies be picking up some Lancôme lushness this Christmas? 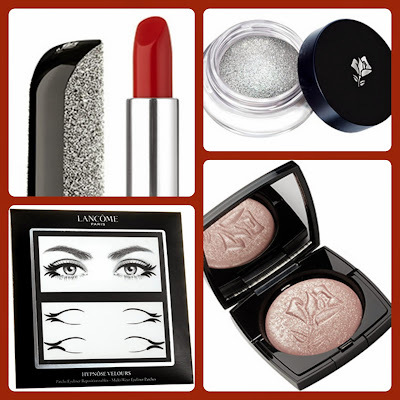 I've seen the Lancome Christmas collection on the counters and it is absolutely gorgeous! The cream shadows and the highlighter are fab! Love the little Christmas tree treats too!